There is still space available in the following workshops at the Bemis School of Art this December! During the winter holidays, considering taking one of these classes or giving them as a gift! Come on down for an evening of artistic expression together! Enjoy painting, pastels, paper craft and more, each Friday will be a different experience! Advanced registration is required. Specially priced for two participants. 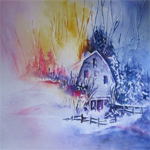 Come in out of the cold and make art! Each day will be a new mixed media adventure in art and creative play. Sign up for one, two or three days. When registering, please include the dates you are requesting. Looking for something creative to do during winter break? Join us for an afternoon of art making; drawing, painting and more. A visit to the Fine Arts Center galleries will be included for inspiration.